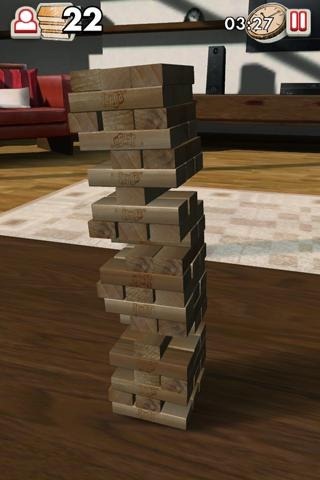 Who doesn't love Jenga? 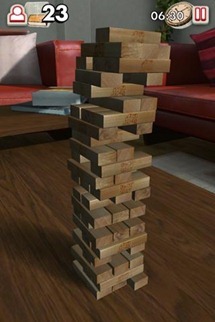 I can't think of a single person that doesn't like to drive themselves totally insane with anticipation playing this awesome leaning-tower-of-blocks game. As of... well, now, you can get that same intense feeling on your Android device, as NaturalMotionGames has brought this family-friendly game to Android. Probably among the most important features of the game is the realistic physics. If you're going to play, you want it to be physically correct, right? NaturalMotion put a lot of work into making sure that each block is accurately affected by removing surrounding blocks, so gameplay should feel just like the real deal. That's just the beginning, though - it offers a local multiplayer feature called Pass'n'Play, so it's just like the real thing (without the hassle of setup, of course). You can also compete with users around the world in terms of tower height, all while you play. 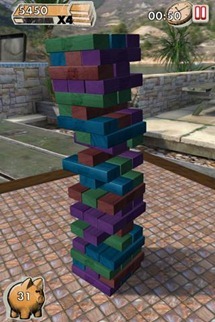 If you're into speed Jenga, you can hit up Arcade Mode, where you'll match up the colored blocks as quickly as you can without toppling the tower. You can earn special bonus coins in-game that are used to buy supercharged boosts like multipliers and collapse reverse. 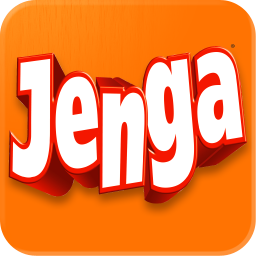 You can get Jenga in the Android Market for $2.99 now.